Join me, Sharon Holland, as I discover the decorative art of embroidery. As an artist of over 35 years and surface pattern designer for a major fabric company, I’ve enjoyed creating in many types of mediums.Taking up embroidery was a natural progression for me and feels like another extension of my art. Although hand stitching a design onto fabric is probably the slowest way I’ve created art, it’s likewise one of the most rewarding. There’s something very zen-like in embroidery work. Embroidery is a relatively inexpensive hobby, it’s portable, and can be picked up and put down without missing a stitch—making it perfect for teaching you the basic stitches in short lessons. I love to stitch in the evenings and decompress from a busy day and hope you too will discover the joys of slow stitching—even if you’ve never picked up an embroidery needle before! 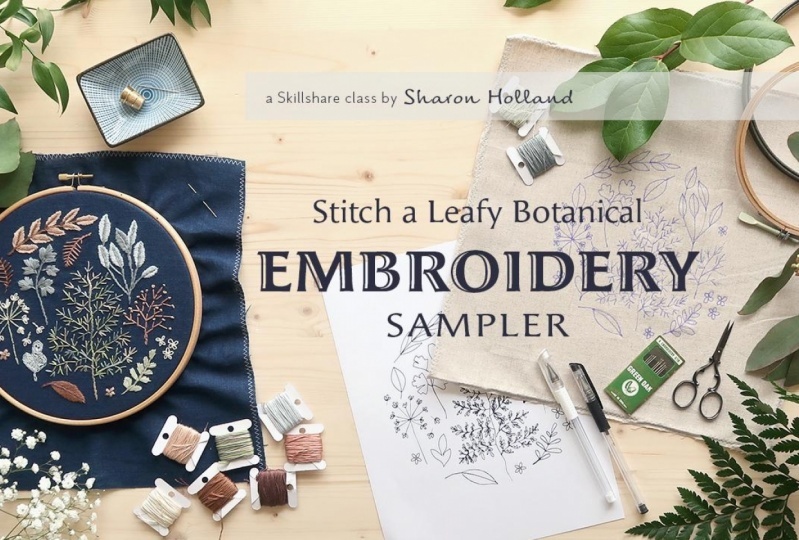 In this class you’ll create a decorative leafy botanical sampler while learning basic embroidery stitches. In this beginning class you'll learn nine fundamental embroidery stitches in easy-to-follow lessons. After each lesson students are encouraged to share their stitching progress with other class members, because it’s so much fun to see your stitches fill the cloth! At the end of this class you’ll have made a stunning botanical sampler suitable for hanging as artwork or sewing into a project. Let’s get stitching!